Huge Savings Item! 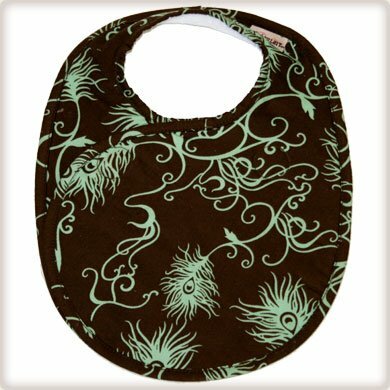 Save 13% on the Bebe Au Lait Double Bib, Mint Chocolate by Bebe au Lait at Spoil the Baby. MPN: Bibs : BBMCX. Hurry! Limited time offer. Offer valid only while supplies last. This is a mealtime revolution. Our two sided Double Bib features Bebe Au Lait's signature chic prints on one side and plush terry cloth on the other. This is a mealtime revolution. Our two sided Double Bib features Bebe Au Lait's signature chic prints on one side and plush terry cloth on the other. It is perfectly oversized. This has two double sided magnets that seamlessly and securely fasten the bib across the chest with zero hassle. The absence of velcro and cumbersome closures also mean baby's skin and cloths are protected. It is totally reversible, with a possibility of four sides, this innovative bib allows for super clean feeding every time, even when busy moms and dads haven't had a chance to wash it. This is 100% machine washable.